Gap is answering that question this holiday season with the help of influential personalities like Lauren Bush, Ryan Kwanten and Donald Glover . From improving nutrition in America’s school system to gifting the season’s hottest fashion trends — including sequin skirts, faux fur vests, refined blazers and chunky knit sweaters — Gap is all about giving this holiday season to you, your loved ones and those in need. Gap has created a series of online video vignettes with influential artists, dancers, musicians and entrepreneurs – like actor Reeve Carney, style blogger Susie Bubble, dancer and choreographer Benjamin Millepied and Foursquare founders Dennis Crowley and Naveen Selvadurai – who open up about their personal causes. Featured on Gap’s Facebook Fan page, YouTube channel, and on Gap.com, fans can check out the videos and then join in the spirit of giving by “liking” them. Each time a video is “liked,” Gap will give a $1 donation to the charity featured in that video, up to $150,000. Plus, fans will get something in return – 30 percent off one regularly priced item for themselves. Model and co-founder of FEED Projects, Lauren Bush , supports FEED Projects by sporting the FEED USA for Gap Canvas Bag ($29.50), The Silky Dolman Dress ($69.50) and The Sherpa Sweater ($128). Moving with ease in The Moleskin Blazer ($98), Benjamin Millepied, dancer & choreographer, supports Baryshnikov Arts Center. 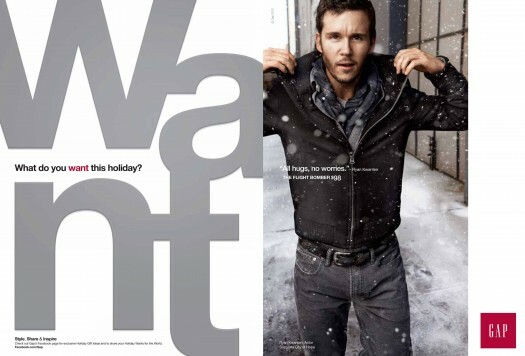 Gap’s “Want” campaign will run in December issues of national magazines including Vogue, Vanity Fair, Nylon, GQ, Men’s Health, Rolling Stone, Us Weekly, Parents and Martha Stewart . Outdoor ads will also be running on bus shelters, phone kiosks, newsstands and more in New York City. Additionally, starting this week, Gap is reaching out to its mobile network of customers once a week through the end of December with exclusive offers and content.